Seems I feel a bit hungry all the time now, despite eating hearty meals. *I am guessing my salad at Culver’s was not Whole30 compliant in some way. ( Cornstarch in the chicken and the cashews may have had peanut oil was all I could find that wasn’t compliant.) For some this would mean the Whole30 was over or needed to be restarted. Being an adult and having my own goals of not snacking and reducing junk food I am merely going to press on. I actually consider this meal a win as I normally order a pork tenderloin sandwich or fried fish plate. And I did not take even one teensy taste of my son’s ice cream. 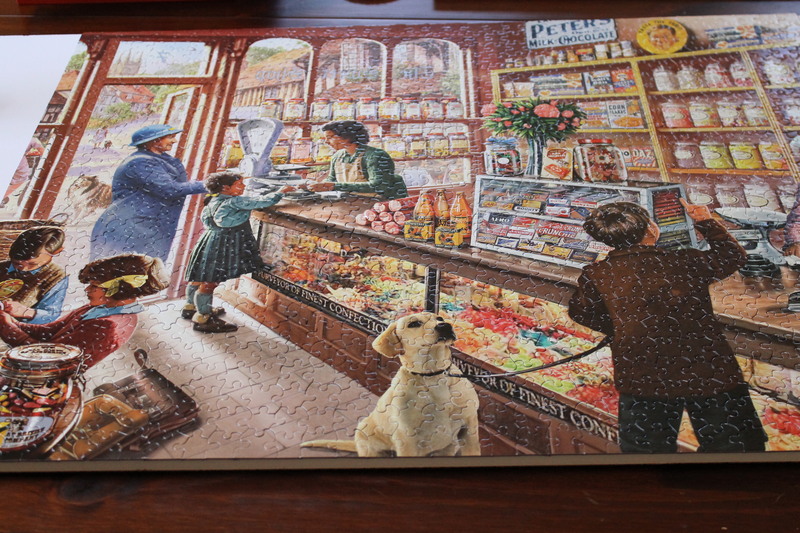 Finished the 1000 piece puzzle! The house smelled wonderful with the roasting meat and dinner was tasty and had an autumnal feel, but frankly it was a bit much for the triple digit heat. Finally the local PBS has the latest season of the “Great British Baking Show” on. I watched the first episode this afternoon. Yum! Well, there is no day 26. I officially ended my Whole30, er Whole25 this morning with a piece of toast (homemade bread from the freezer) and peanut butter (TJ’s no sugar added). I accomplished my goals of no mindless snacking and reduced my sugar intake. I lost 4 1/2 lbs which was rather disappointing. I felt like I ate so much less and certainly no junk food. But I am back in my weight window so I did succeed with my goal. Now the hard part begins…..